You’ve worked hard and long to build a reputation and a customer base. We are all aware of the many horror stories in which companies had a respected brand that consumers could trust only to have that tarnished by one or two negative reviews. In some cases these reviews have been planted by competitors or disgruntled, terminated employees. Pulse of the City News’ research department developed a way to help companies protect their brands and their reputations by analyzing data from multiple sources to determine their annual customer satisfaction rating. Now, companies are protected by a third-party-credible rating system they can trust. 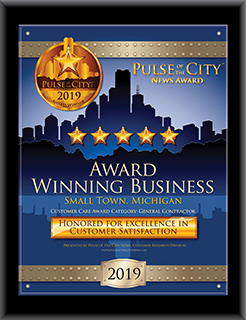 The Pulse of the City Customer Satisfaction Award gives comfort and confidence to potential customers while helping companies keep the customers they already have. Consumers trust awards. In marketing campaigns across the country, companies reference awards they have won to convey trust and integrity and build a comfort zone for consumers. These awards are a reflection of a business’s reputation. Pulse of the City News honors those companies that have earned top ratings for customer satisfaction. This award, used in the right way, contributes to the development of a brand of excellence and attracts new business, keeps customers coming back, and motivates staff and management. Leveraging your award is the first step to building trust with those who don’t know who you are. Use what you have. You earned an award for excellence in customer satisfaction. Spread the news! Our marketing packages have all the tools you need. Our customer care specialists will assist you in finding out what will work best to tell your story. A press release can get you to page one in search engines, our window decals can welcome visitors, our enhanced award page will direct people to you and help tell your story, and more. Simply placing the award image on your website, social media sites and in your emails demonstrates your award status and can help attract new business. And best of all, you earned the right to use them. We congratulate you on your high rating and encourage you to browse our site to learn just how many ways the award can help your company.